How to Convert DVD to DV for Import DVD to FCP (X or 7 included) or FCE with ease? As the powerful and professional video editing software, Final Cut Pro is widely used by video hobbyists and independent filmmakers. Trouble often comes when they try to edit DVD with FCP or try to make video using scenes from DVD. For Final Cut Pro only import any QuickTime compatible video format including DV, HDV, P2 MXF (DVCProHD), XDCAM, and 2K film formats. If you try to import DVD to Final Cut Pro, it will end in fail. To import DVD to FCP successfully, we need to convert DVD to Final Cut Pro workable video format like DV. Bigasoft VOB Converter is just the right DVD to FCP Converter which can easy convert DVD to DV for import DVD to FCP or FCE. The following will present a step by step guide on how to convert DVD to DV for import DVD to Final Cut Pro X, DVD to Final Cut Pro 7 or DVD to any other version of Final Cut Pro. This guide applies to converting all kinds of DVD to DV whatever it is in VOB, MPEG-2 or MPEG-1 format. This guide also applies to convert DVD to DV for import to Final Cut Express or iMovie. Besides convert DVD to DV, the software in this guide also can convert DVD to MP4 for playback DVD on iPad/iPhone/iPod/Apple TV/iTunes. The powerful DVD to DV converter also can convert DVD to MOV for playback DVD in QuickTime without DVD Disc loaded. 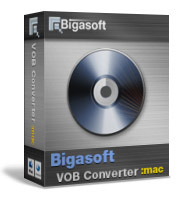 Free download Bigasoft VOB Converter for Mac, install and run it, a nice interface will turn up as follow. Click on "Open DVD" button to load the DVD movie from your Mac or DVD Driver. Click the profile drop-down list to select FCP compatible DV - Digital Video Format (*.dv) from "General Video" category. Run Final Cut Pro, then import the converted DVD video to FCP by clicking File > Import > Files... at the top of the Final Cut Pro window.